Texture: The Honey Stinger Waffle is soft, easy to eat, but can be a little crumbly (espeically around the edges). The Stroopwafel is more firm and has more "chew" to it. This does help it stick together well, but also makes the act of eating it a little more of an effort. The direcitons on the back do encourage you to heat it, which may soften it a bit (I tried it cold). Ingredients: The Honey Stinger bears that little "USDA Organic" symbol, which I really appreciate. I want to know that I'm putting good things into my body so that I can get good things out of it. The Stroopwafel has a number of organic ingredients in it, but is not entirely organic (it is flavored naturally though). Also important to note for those on restrictive diets that both contain wheat and dairy. Nutrition: Both products are 150 calories. They trade off amounts back and forth (HS Waffle has less than half the sodium and iron, GU Stroopwafel has 1g less fat and sugar). Both have 1 g of protein. HS Waffle Left, GU Stropwafel Right. Taste: I have tried multiple varieties of the Honey Stinger Waffles, but only the Salty Caramel flavor of the GU Stropwafel. I really like the Honey Stinger Waffles - they are delicious and definitely taste like a treat (I mean, I could easily see putting these in some ice cream). 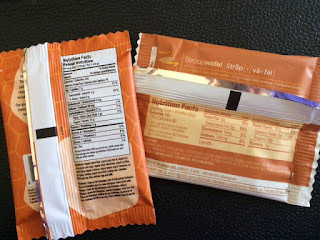 Despite listing natural and several organic ingredients, the Stropwafel did have a slightly artificial taste to me. Bottom Line: I think they are both solid products. For me, I'll stick with Honey Stinger! What do you reach for when you need a snack pre-run? Do you like/prefer either one of these products? I do like the Honey stinger waffles! Have you tried the gingersnap? I have never tried the GU waffle and in fact, I didn't even know they existed. Thanks for letting me know there are other options. Gingersnap is my absolute favorite flavor! Though they really are all good. Let me know what you think if you try the GU version. United Airlines hands out the Stroopwaffles on their morning flights! But they are so sweet, and that's how I feel about the Honey Stinger waffles too. I'm not much for sweet treats. Weird, right? Oh wow, that is really interesting! I think you're lucky you don't like sweet treats - I have a horrible sweet tooth ... and like salty things :) I'm pretty much equal opportunity! Haha!